AMC Theatres - AMC Entertainment Inc. is one of the world's leading theatrical exhibition companies with interests in approximately 360 theatres with 5,128 screens. In the U.S., it significant presence in major urban markets with locations in 30 states and the District of Columbia. About 89 percent of our theatres are located in the U.S. and Canada. Anthology Film Archives - An international center for the preservation, study, and exhibition of film and video, with a particular focus on independent, experimental, and avant-garde cinema. Black Cinema House - Hosts screenings and discussions of underseen works by film & video makers of the African and other diasporas in the historically underserved neighborhood of Grand Crossing in particular and the South Side of Chicago in general. Brooklyn Academy of Music (BAM) - With world-renowned programming in theater, dance, music, opera, film, and much more, BAM showcases the work of emerging artists and innovative modern masters. Carmike Cinemas - A preimiere motion picture exhibitor in the U.S. with 283 theaters and 2,427 screeens in 37 stqtes. Carmike's focus is small to mid-sized communities with populations of fewer than 100,000. Carpenter Center for the Visual Arts - Houses the department of Visual and Environmental Studies of the University, as well as the Harvard Film Archive, the largest collection of 35mm films in New England. It screens a large quantity of independent, international and silent films. Cinema Arts Centre (CAC) - Long Island, New York's year-round, independent and international film showcase. Cinema Cartier - A unique place devoted to the screening of original films never shown before in Quebec City, with the emphasis on classic movies of yesterday and modern works of great film directors, as well as independent features. Le Cartier is also showing foreign film discoveries from the six continents. In a few words, this 117-seat auditorium offers movie buffs a unique opportunity to watch films on the big screen,films they would otherwise not have access to. Cinema Politica - A Montreal-based media arts, non-profit network of community and campus locals that screen independent political film and video by Canadian and international artists throughout Canada and abroad. Cinema Politica is volunteer-run and all screenings are by donation. Cinema Treasures - Devoted to movie theater preservation and awareness. Unites movie theater owners and enthusiasts in a common cause - to save the last remaining movie palaces across the country. Also visit the Preservation Alert page. Cinemark - A leader in the motion picture exhibition industry with 404 theatres and 4,596 screens in the U.S. and Latin America. Cinematheque - A coalition of UW-Madison academic departments and student film groups dedicated to showcasing films which would otherwise never reach Madison screens. As the screening facility of the Wisconsin Center for Film and Theater Research (WCFTR), a member of the International Federation of Film Archives (FIAF), the Cinematheque regularly showcases archival and other rare prints from around the world. Cinemathèque Française - Hosts the largest archive of films, movie documents, and film-related objects in the world. Located in Paris, the Cinemathèque holds daily screenings of a variety of films from all over the world. Cinematheque Ontario - One of five divisions of the Toronto International Film Festival Group, is a year-round screening programme dedicated to presenting the history of world cinema on the big screen in carefully curated retrospectives. From mid-October to mid-August, the Cinematheque offers an ambitious selection of approximately 395 screenings in one of the city's finest cinema facilities, Jackman Hall in the Art Gallery of Ontario. Programmes include director retrospectives, special guest appearances, national and regional cinema spotlights, and thematic series. Cineplex - One of Canada's leading entertainment companies and operates one of the most modern and fully digitized motion picture theatre circuits in the world. Cinespia - See classic cinema at a most unusual venue: surrounded by crypts at the Hollywood Forever Cemetery. Cleveland Institute of Art Cinematheque - Founded in 1986. Presents movies in the CIA's 616-seat, 35mm and SR stereo-equipped Russell B. Aitken Auditorium. Videotapes and 16mm films are sometimes shown in the CIA's 100-seat Ohio Bell Auditorium. Both are located within the Institute's Gund Building at the corner of East Boulevard and Bellflower Road in University Circle. Close-up - Aims to make film culture and history accessible through its video library, film screenings and the online publication of Vertigo Magazine. Drive-In Movie Theaters - Guide to drive-in movies, outdoor theatres and cinemas. Fandango - Movie tickets and showtimes. 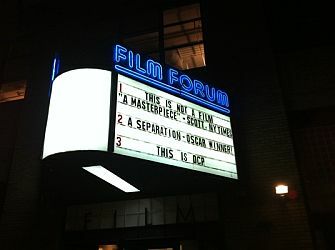 Film Forum - Founded by two young cineastes in 1970, Film Forum is located in NYC at 209 West Houston Street, between 6th Ave and Varick (7th Ave). Presents two distinct, complementary film programs - NYC theatrical premieres of American independents and foreign art films; and repertory selections including foreign and American classics, genre works, festivals and directors' retrospectives. Film Society of Lincoln Center - New York. Founded in 1969 to celebrate American and international cinema, to recognize and support new filmmakers, and to enhance awareness, accessibility and understanding of the art among a broad and diverse film going audience. Gene Siskel Film Center - Chicago. Presents approximately 1,500 screenings and 100 guest artist appearances year to over 65,000 film enthusiasts. Harvard Film Archive (HFA) - Presents films Friday through Monday nights year round. Open to the public, all screenings are held in the Archive's 200-seat theater featuring state-of-the-art film and digital projection located in the historic Carpenter Center for the Arts. IFC Center - Art house movie theater in Greenwich Village for New Yorkers seeking out the best in independent film. Opened in June 2005 in the historic Waverly Theater. After a four-year renovation, the new complex features five state-of-the-art cinemas with luxurious seating, and high-def digital and 35mm projection. Landmark Theatres - Since its founding in 1974, Landmark has grown to 55 theatres, 245 screens in 21 markets. Landmark is known for both its award-winning historic theatres, such as the Tivoli in St. Louis, the Inwood in Dallas and the Oriental in Milwaukee, and its more contemporary theatres, including our flagship theatre, The Landmark in Los Angeles, the Sunshine Cinema in New York City, E Street Cinema in Washington, DC, and The Landmark Theatre Greenwood Village in Denver's flourishing Tech Center. Light Industry - A venue for film and electronic art in Brooklyn, New York. Developed and overseen by Thomas Beard and Ed Halter, the project has evolved into a series of weekly events, each organized with a different artist, critic, or curator. Melbourne Cinemathèque - Discover the richness of the twentieth century's greatest art form. Whether you're a dedicated cinephile or an occasional film buff, Cinemathèque membership provides access to rare and imported prints and the opportunity to revel in a passion for truly great cinema. Movie Theater - Wikipedia entry. Moviefone - Find movies, showtimes, tickets and more. MrMovieTimes - Movie times and theaters in the U.S.
Museum of Modern Art (MoMA) - Advanced screenings and cinema from around the world, selected by the curators of MoMA's Department of Film. Museum of the Moving Image - Advances the public understanding and appreciation of the art, history, technique, and technology of film, television, and digital media. It does so by collecting, preserving, and providing access to moving-image related artifacts, screening significant films and other moving-image works, presenting exhibitions of artifacts, artworks, and interactive experiences, and offering educational and interpretive programs to students, teachers, and the general public. New Beverly Cinema - Los Angeles revival theater owned and programmed by Quentin Tarantino. Many of the 35mm and 16mm prints shown are from Tarantino's private collection. Tarantino wants The New Beverly to be a bastion for 35mm films. Northwest Chicago Film Society - Screening 35mm & 16mm film prints from studio vaults, film archives, and private collections. Pacific Cinematheque - Vancouver, British Columbia. A not-for-profit society dedicated to the understanding of film and moving images. Through exhibitions, film tours, educational services and film-related resources, Pacific Cinemathèque fosters critical media literacy and advances cinema as an art and as a vital means of communication in British Columbia and Canada. Pacific Film Archive - Berkeley. One of the major film reference services in the country. Each year thousands of researchers-students, scholars, journalists, filmmakers, and others-use its services. In addition to providing access to the more than 14,000 films and videos in the PFA collection, the library also makes a wide range of film-related materials available to the public for research purposes. Its collections include more than 8,000 books, 150 journal titles, 7,500 posters, 35,000 stills, and 1,500 audiotapes of filmmakers who have appeared at the Pacific Film Archive, as well as screenplays, international film festival programs, and distributors' catalogs. The library's largest and most heavily used collection comprises some 95,000 documentation files containing film reviews, press kits, and articles on filmmakers, performers, national cinemas, genres, and other topics. Some materials from the documentation files are available online through CineFiles, PFA's film document image database. Also see Film Series. ReelzChannel - Features local movie times for movie theaters across America, as well as movie reviews for current releases. ReelzChannel also features movie trailers for films that are coming soon, viewable on your computer screen now. Regal Entertainment Group - The largest motion picture exhibitor in the world. The company's theatre circuit, comprising Regal Cinemas, United Artists Theatres, and Edwards Theatres, operates 6,386 screens in 539 locations in 40 states and the District of Columbia. Regal operates approximately 18% of all indoor screens in the United States including theatres in 43 of the top 50 U.S. markets and growing suburban areas. San Francisco Cinematheque - Since its foundation in 1961, San Francisco Cinematheque has become one of the most knowledgeable and respected showcases of experimental film, digital media, and performative cinema in the world. South Side Projections - Presenting film screenings throughout Chicago's south side. Most screenings will be accompanied by presentations or panel discussions. State Theatre - Traverse City, Missouri. Owned and operated by the Traverse City Film Festival (TCFF). TCFF was founded by Academy Award-winning Director Michael Moore, who runs the festival and State Theater and serves as president of the board of directors. TheatersGuide - Whether you want to go check out a movie at AMC, Regal, Edwards, UA, or even a local drive-in, TheatersGuide can help you find the closest movie theater to you. Search by state or by the name of the theater. Tricycle Theatre - An independent 300 seat cinema in London. TIFF Cinematheque - Dedicated to presenting the best of international and Canadian cinema to film lovers. What began as a ten-day film festival has grown to embrace programming 365 days a year. TIFF offers screenings, lectures, discussions, festivals, workshops industry support and the chance to meet filmmakers from Canada and around the world. This webpage last updated on Sunday, September 16, 2018 11:46 AM.